Jobs Opportunity is available in Sindh Agricultural University Tando Jam latest jobs March 2019. The Sindh Agricultural University is located in Tando Jam town Sindh Pakistan. Sindh Agriculture University is rated 4th best university in the Agriculture by the Higher Education Commission of Pakistan. 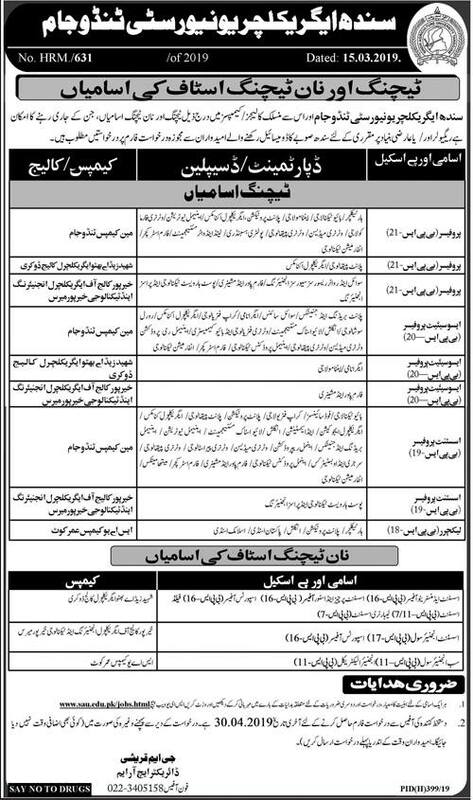 Teaching & Non-Teaching Staff jobs in Sindh Agriculture University Tando Jam, in Pakistan published a newspaper on March 20, 2019. Job searchers who are already working as Teaching Staff, Non-Teaching Staff, Teacher, Female Teaching Staff, Teaching Assistant, Research Teaching Assistant, and Teacher Assistant can also apply for the post of Teaching Staff. For Teaching & Non-Teaching Staffs must have a Degree in Agriculture, Economics, Technology, Bio-Technology, BioScience, Engineering, Veterinary etc. B.E & Ph.D. degree required along with relevant several years’ skill is needed to hold these posts. How to Apply for SAU Tando Jam jobs 2019? Applications can be downloaded from the university’s website at http://sau.edu.pk & must be submitted along with following Application form fees; Rs. 4000/ above for BPS-20 & Rs. 3000/ for BPS-17 & Rs.2000/ for BPS-16 through challan in HBL Bank OR SAU Branch in favor of Director Finance, SAU Tandojam. Sindh agricultural university at Tandojam & Its Constituent colleges /campuses.